Engineering rulers that is not big ears. This is aimed at metric rulers but it does have a bearing on nay rulers you use be it metric or imperial. Now there is no standard for rulers, some are single sided, some double, some all metric, some all imperial, so you would think that with all the choices you could get a ruler that suited ?? The best one I have found to date is a Chesterman all metric, blank on one side [ waste of real estate ?] and metric top and bottom, great, just what I want but because they want to make each scale different ? the top is in mm and the bottom is in 1/2mm divisions. Now 1/2mm are a waste of time for anyone over 25 do to trying to focus and read at the same time, 1/2 a mill is 20 thou and a load of 20 thou marks gets blurry quickly. The reason you need the same on both is that say when marking off the rule is flat on the work, butted up to a square and you need the top divisions. But now come to measure a shoulder on the lathe and you need to use the bottom divisions to go from the shoulder to the tool tip and you are forced to use the 1/2mm divisions. If they weren't there you could easily split a 1mm division by eye but because they are there it gets confused dead quick. The same applies to the Imperial brigade, we have 1/10" 1/20" 1/8" 1/16" 1/32" and even 1/64" and 1/50" all mixed up. Wouldn't it be nice to have a rule with the same divisions top and bottom be it metric or imperial ? No joke but I must own close to 40 rulers and not one suits what I want to do in the workshop, surely I'm not that special or nit picking? but I know I could work a lot faster with a rule that suits. Some years ago I found a small free utility that let you layout a ruler in whatever divisions you wanted and I believe it generated either a G Code or a dxf file but I can't find it. I could do it in CAD easily but I'd like to find the software again, it was called ruler I'm sure but a web search only finds all the on screen rulers etc. Anyone got a link ? Hi John, I couldn't agree with you more. Very frustrating is'nt it. I luckly have two 300mm ones that are the same top from right hand edge and bottom from the left hand edge and on the reverse side are the same top and bottom but with the addition of the half mm devisions. These are a bit long for use in the lathe, but for marking out on flat metel are ideal when you have left and right mesurements to mark out. There seems to be a wholesale lack of this type of rule. As you say you get imperial rules with all the fractions that you mention, but in my experience, 9 out of 10 times thier positions are completly U/S. If you can find one these days, a useful instrument is a turner's rule. This has the graduations across the ends of the rule, with the zero at one end on the left and at the other on the right. Measurement up to a shoulder can be made from the front or the rear, as most convenient. I picked up a couple of them (Brown & Sharpe) at an exhibition some years back, but haven't seen them since. Unfortunately, mislaid one. In my schooldays you woud get a rap on the knuckles with a rule for calling it a 'ruler' but I know just where you are coming from. I like the sound of the one Nick describes - if any one knows a source please let us know. scale is 0.5mm and the bottom in mm. Best of both worlds. Many years ago the NPL did a lot of research on gauge graduation and for a while you could buy rules where the small graduations were longest in the centre of the unit (cm or inch as appropriate), tapering down to shortest at the "whole unit" lines. This made it MUCH easier to read, I wonder why no-one still makes them? But they did have just what I want so i bought two of each size in 100mm, 150mm and 200mm lengths. With shipping it came to a tad under 26 Euro's for all six. I guess it is my incompetence that is at fault, despite using a good pair of dividers. I use these a lot for marking out. These things are that cheap now I have no worries about cutting a set up for special purposes, just grind one leg back further than the others and job's a gud 'un. I got in trouble for using my slide rule to draw a straight line! I still have a couple, and a book that explains how to use it in 'simple' terms (not). My most useful rule is 1" cut out of a cheap and cheerful square. Get in close like those turner's rules. Cheap combination sets are a useful source of rigid rules for putting in a stand and setting height guages etc. 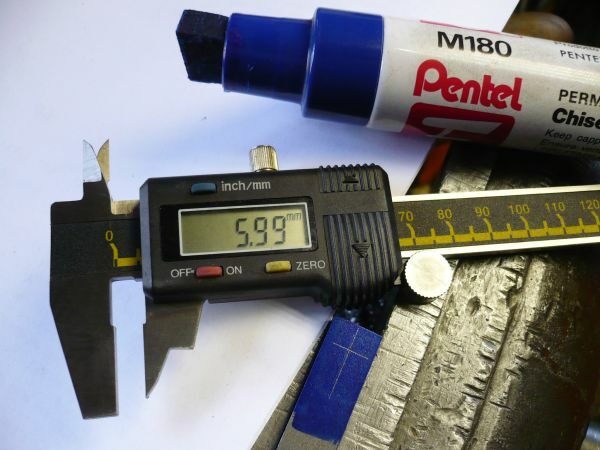 Second most useful is a very flexible rule graduated down to 1/100" and 0.5mm. My hack rule is a cheap one with the odd sixteenths slightly out - do NOT use for measurement. I have varous others, including the 12" rule I was given for my 14th Birthday, and a found three-foot folding rule that has had a very long, hard life. I still have two slide rules from the old days, a 6" Faber Castell pocket version and a double-sided Aristo which is about 13" long. Never use them now but would hate to get rid of them. Do we old engineers never get rid of anything? I think John Shepherd 1 must have had the same teacher as mine, still I've never forgotten that it's a rule, so the rule across the knuckles worked. I find that getting rid of stuff usually involves discovering that you need it a couple of days later. It’s the same sort of Imperial/metric mixture on my Toledo rules (150mm and 300mm). I’m into metric, so the flip-side hardly gets used. Now for a couple more digressions. My father, who was born in 1913, was adamant that it’s a rule not a ruler. Fortunately, it didn’t need a whack across my knuckles to hammer home the point. That only occurred at school and for different reasons. It just goes to show that violence wasn’t really necessary after all. As part of my apprenticeship, I had a six-month spell in the DO c.1953. It didn’t take long to be caught using my slide-rule to do some calculations. The section leader told me to burn it. "We use longhand or six-figure logs in here!" he declared. During exams at Tech., we were obliged to tape over all those useful formulae printed on the backs of our slide rules. He might have been and I was taught the same but no one told the Oxford Dictionary which has both spellings so technically both are correct. Sorry if that offends anyone! I will certainly use it myself. As a rule I would post in this thread, but I won't, as I'm working to rule. Hi, I'll not rule it out myself Andrew. As far as the definition goes between rule and ruler, in my dictionary, rule has 10 definitions. The first being devided into a & b; a, being, govening power and b, the period that such authority lasts. Rule as a measuring device comes in at eighth place. The definition for ruler has only 2. The first being, one that rules. The second pertaining to a measuring device. Therefore in your schooldays John you may have been closer by calling it a ruler and your rap on the knuckles unjustified. Have to agree with John on this one. I hate those 1/2mm graduations, but find it easy to judge half a millimetre by eye. If I understand the requirement correctly, I have two rules made by Moore & Wright, one is 150mm and the other 300mm. Bought both in my younger days when the value of the design was not appreciated....or else several would have been bought. So far, I have been unsuccessful in obtaining duplicates. PS I was taught that a Ruler had extra bits on the ends, so that a line could be drawn 1 ft long and the pencil did not fall off the end. Whereas a Rule was for measuring accurately from one end, so the grads started there. Thanks for the links to the paper creation sites, have already downloaded some.